The Cockrell Butterfly Center and Brown Hall of Entomology at the Houston Museum of Natural Science provides entertainment and education for the whole family. Walk through a living 3-floor butterfly habitat, marvel at live and preserved specimens of some of the world’s largest and weirdest arthropods, and enjoy interactive games and quizzes. This activity includes your entrance fees to the Cockrell Butterfly Center. Enter a stunning, three-story glass structure built around a 50-foot waterfall. This simulated tropical rain forest is filled with exotic plants and thousands of live butterflies. As you walk through the three-story glass rain forest at your own pace, feast your eyes on a rainbow of color provided by the thousands of live, fluttering butterflies and exotic flowering plant species. Absorb all the beauty of the living rain forest, and then make your way to the Brown Hall of Entomology and witness astounding living insects, spectacular mounted specimens, larger-than-life models, and interactive games. Search for camouflaged creatures, meet a cricket weatherman, learn how insects are used to solve crimes, watch leaf cutter ants at work, see giant wasp nests, get a close-up look of some of Houston’s largest cockroaches, and more. Do not forget to view the fabulous Chrysalis Corner in the hall. 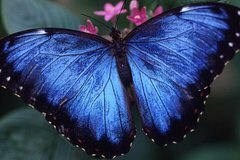 Witness butterflies emerge from their chrysalis, dry their wings, and be released into the rain forest. Tucked underneath the waterfall and behind the cenote pool, discover how insects are particularly important to humans. Listen to interviews with real-life entomologists and take a peek into an entomologist’s lab, where you can look up close at insect specimens. Pick up some butterfly gardening tips, learn about backyard beekeeping, and explore the best ways to control mosquitoes. Finally, make your way back to the main level: The Land of Beeyond. This immersive insect environment is perfect for families, where kids can play in a giant beehive, make insect rubbings, put together puzzles, or enjoy insect picture books.